Summer is a time of abundance for flowers, with all colours and shapes available. For something traditionally meadow-like, there are Alchemilla (lady's mantle), campanula, marguerite (Chrysanthemum frutescens) and other annual chrysanthemums, and solidago or goldenrod. Similarly cottage-garden in appearance are Aconitum (monkshood), alliums, peony, phlox, scented stock (Matthiola), sweet william (Dianthus barbatus), sweet pea, godetia or clarkia and sunflowers. More exotic summer flowers include Eremurus (foxtail lily), tuberose (Polianthes), and the bright sky-blues of agapanthus, hydrangea, trachelium, and triteliea. 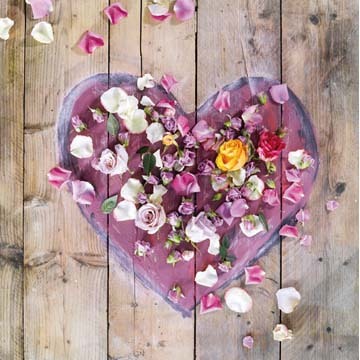 Express your personality through flowers, whether it's with flower jewellery, floral handbags or heart-shaped designs. Find a personal meaning for you, using the diva flower of the Summer, roses. Fantasy and creativity - interpreted in the vibrant, strange, natural world of this summer's flower fashion theme. This season the trend is all about finding peace and quiet within four walls by bringing nature indoors and blurring the boundaries between outside and in. Get up and go! Take traditional and modern flowers and mix together in relaxed posies and adorn your outside space. Blue skies and sunshine, bold and colourful flowers arranged in a relaxed and natural way. Life's a beach! A perfect ecological balance of light and shade, rough and smooth, protective camouflage and astounding flashes of gleaming colour. Bright and dazzling colours contrast with faded tones - as if some of the flowers have faded in the sun. Deep shades of red, pink, flesh and maroon combine for a steamy summer trend. Sunbleached, tanned Scandinavian meadow flowers with the emphasis on natural elements. Rich reds and purples with tropical foliage for a taste of Africa.